Injury-hit Doncaster RLFC upset the odds to beat Championship Batley Bulldogs in the fifth round of the Challenge Cup at the Keepmoat. Despite fielding a makeshift half-back pairing and a much-changed pack the Dons rose to the occasion and posted a hard-earned 16-12 win over a side which had become only the second team to beat Widnes this season the previous week. And no one did more to secure what looked to be an unlikely victory when the teams were announced than the club’s longest-serving player Kyle Kesik. Playing in his third different position this season, Kesik produced a man-of-the-match display in the key stand-off role. But the forward will be the first to admit that victory was based on a tremendous team effort with everyone playing their part. Batley enjoyed the better of the territorial exchanges in the opening six minutes without ever threatening the Doncaster line. But the Dons would have taken the lead against the run of play on eight minutes had Connor Bower, playing out of position in the second-row, been able to touch down from a clever grubber kick close to the line by Kesik. The Dons were almost in again on 13 minutes – winger Sam Doherty going close in the right corner following some good build-up play. Batley created a couple of chances on their left flank during the first half hour but on both occasions the ball went to ground with the Doncaster defence stretched. Just when it looked as though the two sides would go in still level at 0-0 the Dons broke the deadlock on 37 minutes. Scrum-half Jordie Hedges, who also tagged on the conversion, put in a kick to the line which Bower plucked out of the air to score. A superb run down the right flank by winger Wayne Reittie created the position from which Michael Ward raced in under the posts for a try converted by former Dons full-back Dave Scott to level the scores after the break. The Championship side got their noses in front on 53 minutes - Reittie charging over from close range in the corner to score against his former club for the fifth successive game. Scottish international Scott added the touchline conversion to give his side a 12-6 lead. 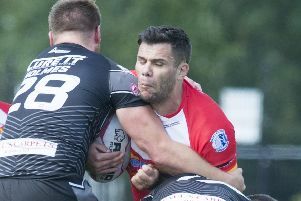 Batley found themselves down to 12 men on 56 minutes after having a player sin-binned for a late tackle on Kesik. They paid the price when centre on-loan centre Menzie Yere forced his way over from close range on his debut soon after. The home side regained the lead on 65 minutes when Doherty did well to get the ball down under pressure in the corner and Hedges added the extras. Doncaster had to dig deep at times during a nail-biting finish but deservedly held on to their narrow lead to claim the spoils. Dons: Buchanan, Doherty, Tali, Yere, Chrimes,Kesik, Hedges, Lund, Hedges, oyle, Ogden, Spiers, Bower, Patterson-Lund, Foster. Subs: Scott, Bastas,Townsend, Lawton.